Heads Roll At TV Station That Broadcast Bogus Pilots Names : The Two-Way The Bay Area's KTVU-TV broadcast obviously made-up and offensive names of what it said were the pilots on board Asiana Flight 214, which crashed on July 6. Now it has reportedly taken action against some of the staffers who were at the station that day. 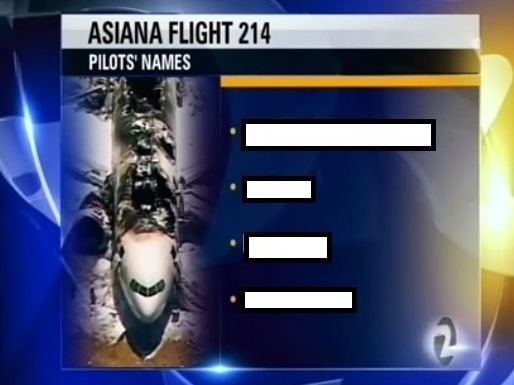 Three of the station's staffers who were at work when KTVU-TV of Oakland broadcast obviously bogus and incredibly offensive names of what it said were the pilots of Asiana Flight 214 have been dismissed and more departures may soon follow. That's according to reports from Bay Area media blogger Rich Lieberman as well as San Francisco Chronicle columnists Phillip Matier and Andrew Ross. Two young people died from injuries they sustained in the crash of Flight 214 at San Francisco International Airport on July 6. Scores more from among the 307 people on board were injured. A teenage girl succumbed to injuries she suffered when she was hit by an emergency vehicle responding to the scene. KTVU broadcast the bogus names. We've blocked them out because they're offensive. As you've probably heard by now, KTVU was reporting about the investigation of the crash on July 12 when, as the Chronicle columnists write, "anchor Tori Campbell announced that 'KTVU has just learned the names of the four pilots who were on board' the ill-fated plane." She then "proceeded to read from a teleprompter while the phony names were displayed on a graphic." The made-up names of pilots said to be in the Korean airline's cockpit were crude attempts to mock Asians. If you haven't heard or seen them by now, the four "names" are easy to find on the Web. Our standards and practices guidelines counsel against posting such material unless absolutely necessary — and in this case it doesn't seem to be. Asiana threatened to sue KTVU over the broadcast — a threat it later decided not to follow up on. The TV station has, though, tried to get YouTube clips of its infamous broadcast taken off the Web by issuing copyright-infringement notices. It's unlikely, though, to have much success getting TomoNews US to pull down this reenactment. According to the reports about the dismissals, three producers at KTVU have lost their jobs — one of them for tweeting about the gaffe. A fourth staffer who had already planned to retire is also leaving. Lieberman blogs that the station has not finished its investigation. Officially, KTVU has not commented to Lieberman, the Chronicle or other news outlets. As for where the bogus names came from, the Chronicle columnists say that "sources tell us the fake names — which had been posted on the Internet at least two days before — came to the station via e-mail from an expert source who had provided information to the station in the past." KTVU has said it "confirmed" the information with the National Transportation Safety Board. That agency subsequently dismissed an intern who supposedly supplied that "confirmation."